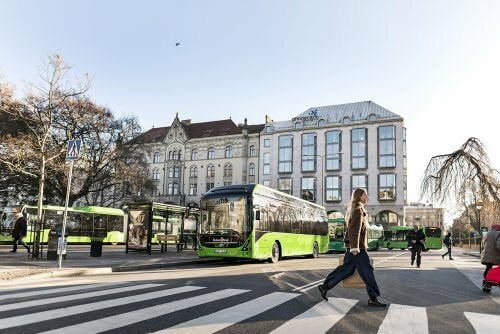 Volvo Buses has received an order for three all-electric and three electric hybrid buses from KE’s Bussar in Kungsbacka on Sweden’s west coast. They mark the premiere of electrified buses in the city with operation scheduled to start in June 2020. Charging will take place using 150kW CCS chargers at the operator’s depot. Energy consumption is about 80% lower than for a corresponding diesel bus. “We’re delighted and proud to receive this order from KE’s Bussar,” said Daniel Treptow, salesperson at Volvo Buses. Kungsbacka is the fourth Swedish city to buy Volvo’s all-electric buses, after Gothenburg, Malmö and Uddevalla. Volvo’s electric hybrid buses have been in regular operation since summer 2018 in Värnamo and also operate on route 55 in Gothenburg. In addition to the all-electric Volvo 7900 Electric, the Volvo Buses range of electrified vehicles includes hybrid buses and electric hybrid buses (plug-in hybrids). All told the company has received orders for more than 4,200 electrified Volvo buses globally.